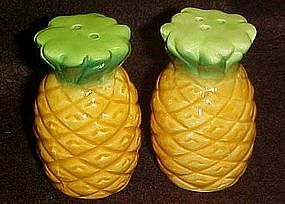 Nice pineapple shaped salt and pepper shakers are made of glazed ceramic. No cold paint. replaced plastic stoppers. Measures 3" tall are in excellent condition with no chips or cracks. Would fit in nicely with a Hawaiian theme. I have 2 sets now available. Price is for each set.